Geelong as a city has always been viewed from the outside at least as a small, rather backward country town. Maybe even some of its own residents viewed Geelong the same way. And the city’s football team suffered the same fate. Many great players have played for the Cats over the years, but team success or lack of was a constant source of annoyance and frustration. All that changed in 2007 when the club finally broke through with their first AFL premiership since 1963. It was a long wait, but rather than rest on their laurels the club won again in 2009 and 2011. And were unlucky in 2008, losing to a more accurate Hawthorn. 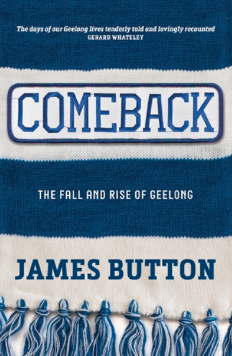 James Button, son of former minister in the Hawke government and a recent speechwriter for Kevin Rudd, has written Comeback: The Fall And Rise Of Geelong. It’s impressive, it’s full of interesting interviews and provides a terrific snapshot of a club, a city and a people for whom success came late and life hasn’t always been easy. The detail here is undeniably thorough. Button knows his subject matter, knows the city and the people, and knows about Geelong football. In 1989 Malcolm Blight took charge of the Cats and took the club to that years’ grand final, only to be pipped at the post by Hawthorn. But it was a significant change. Geelong had struggled throughout the 1980s, but Blight brought a more attacking and ultimately successful style of football with him. Geelong lost further grand finals in 1992, 94 and 95 but the upside was they were now a regular finals player, and went deep into September. Blight and his replacement Ayres left but as the 2000s got under way a growing feeling of the ultimate success was coming. And it was an Essendon old boy, former captain Mark Thompson who would deliver it in 2007 against Port Adelaide in the grand final. Years of ridicule and heartache were over. More flags followed and Geelong was no longer viewed as the poor relation to Melbourne. Button here creates a backdrop to the main event; football and winning football. He writes with style and authority. Most football books tend to be geared towards fans of a certain club. Not so here. Much can be learnt by all club fans, as well as club CEO’s from reading Comeback. Especially standing your ground when things do get tough, like they did for Geelong and Thompson in 2006 when he was close to losing his job. The loyalty paid off. And this book pays off too. A very good read that is written with personal engagement that shapes the story telling without being obtrusive.